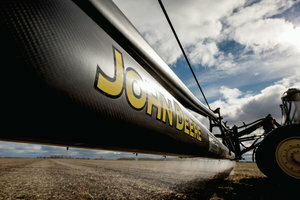 Fortune Magazine has once again recognized John Deere as a leader in its Construction and Farm Machinery category. The list, which is created by Fortune in collaboration with Korn Ferry Hay Group, recognizes companies for everything from social responsibility to quality management. More than 1,500 companies are reviewed for the Most Admired list. Other companies that made the 2017 list include Amazon, Starbucks, and Walt Disney. To select its top 50 companies, the researchers asked 3,800 executives, directors and securities analysts for their input into the 10 companies they admire most. They were able to choose from a list of businesses that made the top 25 percent of last year’s survey, in addition to those that finished in the top 20 percent of their industry. John Deere also made last year’s list. "Our focus each day is to serve customers around the world with great products and services," said Allen, at the time of the announcement. "Rankings such as the Fortune Most Admired list indicate we are conducting our business in line with the company's four core values of integrity, quality, commitment, and innovation."